You may have noticed that so far, there’s been little rhyme nor reason to which numbers Josh does and which numbers I do. It’s been a factor of who has the time to get a couple prepared, mainly. So when we started talking about a more even split in the last 30, he suggested I take the odd numbers and he’d do the even. Unknowingly, that’s going to work out extremely well for me, because some of the numbers that resonate the most with me tend, for some reason, to be odd ones. This is one of them. While obviously Lonnie Smith, otherwise known as “Skates”, made his mark in St. Louis and won a World Series in that number, he was just a bit beyond my time. By time I was paying attention to baseball, Smith had moved on and I knew him more as the Atlanta Braves outfielder who couldn’t score in that classic Game 7 pitching duel between Jack Morris and John Smoltz in the 1991 World Series. Zeile was actually one of my favorites growing up and I still have an Arkansas Travelers scorecard signed by him and Jeff Fassero when they were just Cardinal farmhands. It was fun as a fairly new Cards fan to see a rookie coming up through the system and being touted as one of the best in baseball by various magazines. Nowadays, of course, we kinda take that for granted given the farm system that John Mozeliak has put together, but back then, it was a novelty. However, all of them pale in comparison to the greatest 27 of them all. I still remember how exciting the summer of 2002 was for me as the rumors continued to escalate that the Cardinals were interested in Rolen. I was a big fan of his, mainly because he could play defense better than any third baseman I’d ever seen. Of course, you get the arguments of whether folks like Brooks Robinson were better, but anytime you can legitimately have that argument, you know it’s a special player. That’s why I tried to make sure to get a picture of him fielding for our countdown today. The number might be obscured a bit, but his defense was his signature. Of course, he was no sucker at the plate either, which was nice. 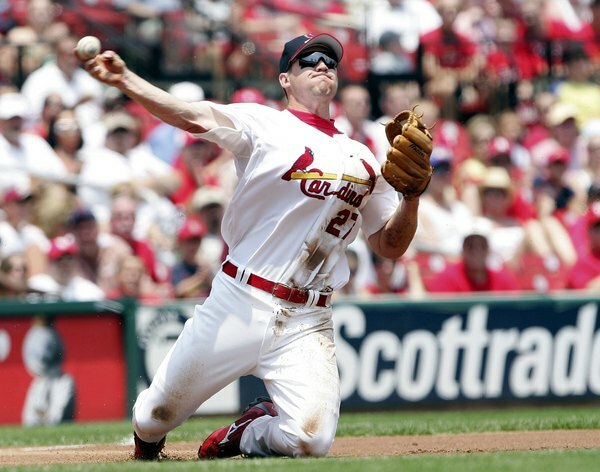 Part of the legendary MV3, Rolen was a dominating middle-of-the-lineup force when he was healthy. with three seasons of 20-plus home runs following Jim Edmonds and Albert Pujols to the plate. His 2004 was just incredible, as he hit .314/.409/.598 and had an fWAR of 8.9. While injuries sapped him some during his career (darn you, Alex Cintron and Hee Seop Choi! ), he still could bring it when it counted. If it wasn’t for the “scrappy boy makes good” storyline, I’m confident that he would have gotten the 2006 World Series MVP over David Eckstein. All he did was hit .421 (8/19) with three doubles and a home run in the five games. Eckstein had some big hits, but nobody was as consistently good as Rolen was in that Series. He was that good partly because he was playing with a huge chip on his shoulder, having been benched by Tony La Russa earlier in the playoffs. When the injuries flared up again in 2007, the bickering between him and TLR became too much for the organization to take. Rolen wanted out, uncomfortable in the organization he’d dreamed of joining just years prior. It was a disappointing trade for me because it seemed at the time the organization had chosen to side with TLR instead of a talented and quality player, not realizing that he’d demanded the trade. You can still read my reaction over at the original incarnation of this blog, by the way. I’d like to see Rolen come back into the Cardinal fold much like Ozzie Smith has in the past couple of years. The atmosphere is very different now and he’d be a great coach or resource for the club. Then again, given how Rolen quietly slipped into retirement, he may be one of the few ballplayers that doesn’t need to be in baseball. He very likely is perfectly happy at home with the family and the dogs and doing what he can around his community. He strikes me as that kind of guy. Another reason I was fond of him. If he does want to stop by Jupiter, though, I believe a warm welcome would be awaiting him.